At S&L Roofing, we specialize in residential roof inspection, maintenance, and repair, and have decades of experience performing these services on gravel and cap sheet flat roof roofing systems. Over the years, we have provided our exceptional quality, affordably priced roofing services to 1000's of satisfied homeowners throughout South Orange County, and possess the knowledge and expertise necessary to resolve any and all home roof maintenance and repair issues in an effective and cost-efficient manner. Gravel and cap sheet flat roof roofing systems are subject to issues which can develop as a result of weather damage, foot traffic, and ponding water. Wind, rain and foot traffic can dislodge the gravel layer exposing the hot mop surface, and can damage cap sheet seams, enabling water to seep under the cap sheet and cause bubbling. These bubbles can then break due to foot traffic or rough weather, with disastrous consequences when ponding water becomes an issue during foggy or rainy weather. Older flat roof systems were not designed with slopes to promote good drainage, and even newer flat roof systems designed with slopes can lose slope pitch as the home settles over time, leading to water ponding on the roof. And this standing water will seek exposed nail holes and any other poorly sealed roof penetrations on damaged gravel and cap sheet roofs, causing roof leaks. 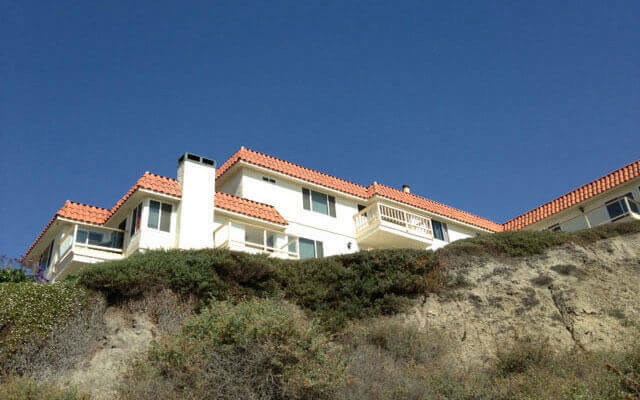 Call us today, to schedule a free onsite roof maintenance and repair estimate in Mission Viejo, Lake Forest, Aliso Viejo, Laguna Niguel, Dana Point, and surrounding South Orange County city. At S&L Roofing, we believe that proper roof maintenance is essential to prevent the need for major roof repairs, and have designed our roof maintenance services to be an affordable means of ensuring your residential flat roof system's long-term health and proper functionality. Check the roof for bubbling or blistering, and exposed paper - repair as needed. Evaluate the condition of the roof's flashing. Check for roof ponding issues. Determine points of roof leakage, if any; look for areas where future leaks may form. Check for debris build-up in roof drains and rain gutters - perform cleaning services. Owner, Leo Valdez, responded in a timely manner to help solve an indoor leak problem and the work was completed in a very timely manner. Three weeks later the leak was even worse and Leo returned with a willingness to get to the root of the problem. He was unable find the leak and he even showed me how dry things were under the tiles and felt. At that point I had an idea that the leak may be coming from a non-roof area and I discovered this to be the case. Leo stayed cool and promptly finished up the unnecessary roof work. I appreciated his . 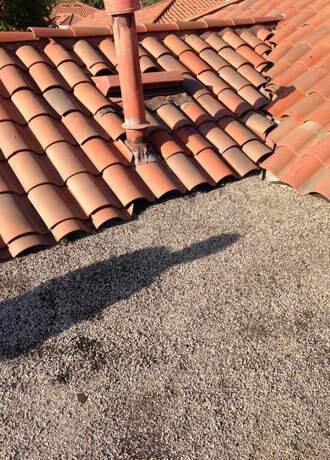 . .
After: With the properly positioned pitched roof tiles and flat roof leak repair, the roof of this Rancho Santa Margarita home is now protected from water damage, weathering, and the accumulation of dirt and debris.